A sunburn is a common reaction of the skin to prolonged exposure to the sun. 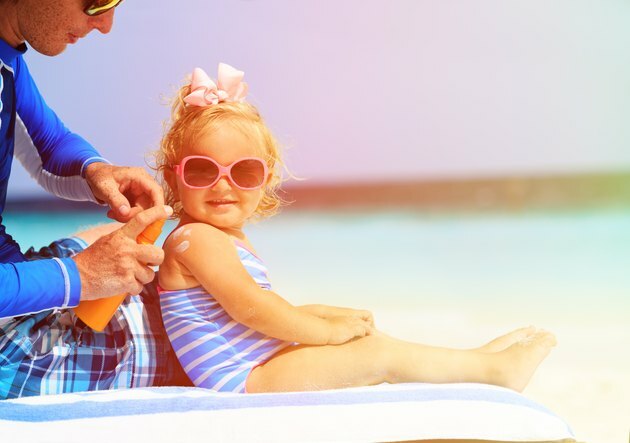 Unless there are blisters or other signs of a second-degree burn, sunburns tend to get better on their own after a few days. If you are experiencing extreme pain, blisters or severe swelling, you should consult your doctor for more appropriate medication and treatment. Cooling down the skin on your face should be your first goal. Fill a large bowl or the bathroom sink with cool water. Close your eyes, hold your breath and put your face in the water. Hold for a few seconds. If you don't have access to a bowl or are uncomfortable with the process, use a soft towel soaked with cool water and pat your face softly. Mixing up equal parts of milk and water also helps. You can also add Burow's solution, which you can find at any pharmacy, into the mix. After the initial heat has eased, keep your skin moisturized to help it heal. If your face is peeling, scrub softly with a cotton cloth dampened with cool water. You can also use a face scrub, but choose one that is not too rough so it won't worsen the burning sensation. After cleansing and scrubbing, apply a gentle face cream or pure aloe vera gel; you can use the gel from a fresh leaf of aloe vera. Simply cut it open and rub directly on the skin. Another way to treat a sunburned face is to head to your kitchen. Make a paste of tomato and cucumber puree. Mix with some lemon juice and then apply to the burned area. This is especially helpful if the skin is feeling hot and sensitive. Avoid the eye area, since the lemon can cause burning if it gets into your eyes. Yogurt is also good for sunburn and even better if you can mix it with rosewater. Over-the-counter medication such as ibuprofen (Advil, Motrin) may decrease inflammation, swelling and pain after facial sunburn. Check with your doctor to see if these medications are safe for you. Health Cares: What Are the Treatments for Sunburns?